The Nevada attorney general is competing in one of the most competitive, closely-watched gubernatorial races in the country. RENO, Nev. — Nevada Republican gubernatorial candidate Adam Laxalt says he was a "reckless and foolish" teen when he was arrested for assaulting a police officer more than 20 years ago in Virginia. Records obtained by the Reno Gazette Journal from the city of Alexandria show the Nevada attorney general was taken into custody for underage drinking in 1996. A 17-year-old Laxalt was drinking at a woman's house when officers were called, according to the report. After police entered the residence, Laxalt said he "reacted the wrong way" and tried to keep police from coming into the home. "Today, as a law enforcement officer, I understand they were just doing their jobs," he told the newspaper. 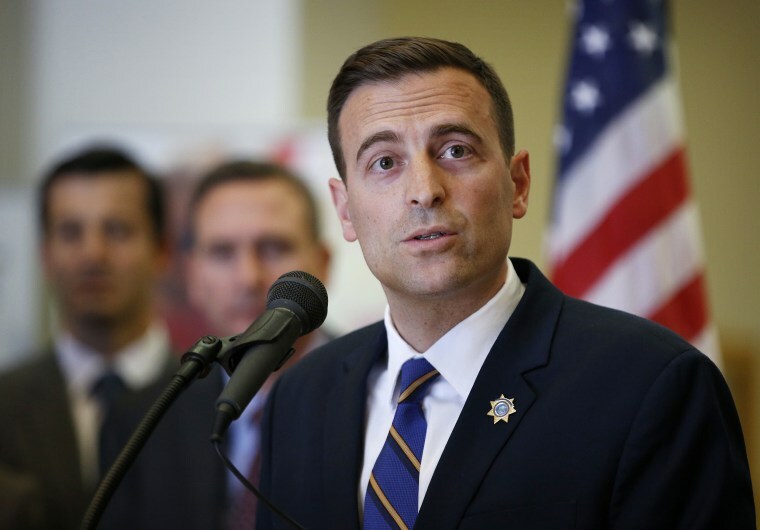 "These revelations about Adam Laxalt's criminal history are incredibly concerning, and even more concerning is the fact that Laxalt has failed to come clean about his record until just now," McCurdy said. Nevada is one of 26 Republican-held governors' offices up for grabs this year and one of eight where Clinton won the presidential vote over DonalTrump in 2016. The incumbent, moderate GOP Gov. Brian Sandoval is term-limited. Sandoval has refused to endorse Laxalt in his race against Democrat Steve Sisolak, chairman of the local governing body for Clark County, which is home to about two-thirds of the state's population. Trump endorsed Laxalt, a former lieutenant in the U.S. Navy, who handily won the GOP primary. Laxalt is the 39-year-old grandson of former U.S. Sen. and Nevada Gov. Paul Laxalt. Laxalt has been public about his struggle with alcoholism. He was arrested for driving under the influence in Virginia in 1997 and entered a rehabilitation program at age 18. "As a teenager, I was often reckless and foolish. I've never shied away from telling that story," Laxalt told the newspaper. "I got my life back, and now I want to help others do the same. It's why I've worked to help others battle addiction and pursue lives of purpose and dignity." Other report summaries obtained by authorities in Alexandria, where Laxalt was raised, show that Laxalt was the alleged victim in three reported criminal incidents between 1992 and 1994. Sisolak beat a challenger from the left during the primary and has pledged to stand up to Trump and the National Rifle Association while defending Planned Parenthood. Laxalt wants to repeal a state commerce tax. Sandoval, has not made an endorsement in the race. Nevada is a political battleground state where the two major parties split control of the Legislature.